Unbend the paperclips and connect one to each terminal of the battery. Place the other ends, not touching, into a container of water. That's it! You'll get bubbles off both wires. The one with more bubbles is giving off pure hydrogen. The other bubbles are impure oxygen. You can test which gas is hydrogen by lighting a match or lighter over the container. The hydrogen bubbles will burn; the oxygen bubbles will not burn. 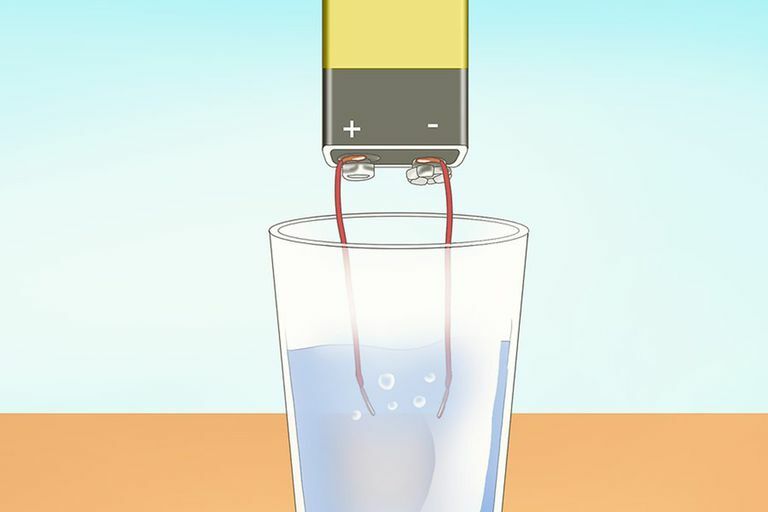 Collect the hydrogen gas by inverting a water-filled tube or jar over the wire producing the hydrogen gas. The reason you want water in the container is so you can collect hydrogen without obtaining air. Air contains 20% oxygen, which you want to keep out of the container in order to keep it from becoming dangerously flammable. For the same reason, don't collect the gas coming off both wires into the same container, since the mixture could burn explosively upon ignition. If you wish, you can collect the oxygen in the same way as the hydrogen, but be aware this gas is not very pure. Cap or seal the container before inverting it, to avoid exposure to air. Disconnect the battery. There are two simple improvements you can make to improve the efficiency of hydrogen gas production. You can use graphite (carbon) in the form of pencil "lead" as electrodes and you can add a pinch of salt to the water to act as an electrolyte. The graphite makes good electrodes because it is electrically neutral and won't dissolve during the electrolysis reaction. The salt is helpful because it dissociates into ions which increase the current flow. Prepare the pencils by removing the erase and metal caps and sharpening both ends of the pencil. You're going to use the cardboard to support the pencils in the water. Lay the cardboard over your container of water. Insert the pencils through the cardboard so that the lead is submerged in the liquid, but not touching the bottom or side of the container. Set the cardboard with pencils aside for a moment and add a pinch of salt to the water. You could use table salt, Epsom salts, etc. Replace the cardboard/pencil. Attach a wire to each pencil and connect it to the terminals of the battery. Collect the gas as before, in a container that has been filled with water. You can get hydrogen gas by reacting hydrochloric acid with zinc. Hydrogen gas bubbles will be released as soon as the acid and zinc are mixed. Be very careful to avoid contact with the acid. Also, heat will be given off by this reaction. This is an extremely easy method of making homemade hydrogen gas. Simply add some water to the drain clog removal product! The reaction is exothermic, so use a glass bottle (not plastic) to collect the resulting gas. The main safety consideration is making certain hydrogen gas isn't allowed to mix with oxygen in air. Nothing bad will happen if it does, but the resulting air-hydrogen mixture is much more flammable than hydrogen on its own because it contains oxygen, which acts as an oxidizer. Store hydrogen gas away from an open flame or other ignition source.